Last Event: Thursday May 10 5 p.m. - 6:30 p.m. 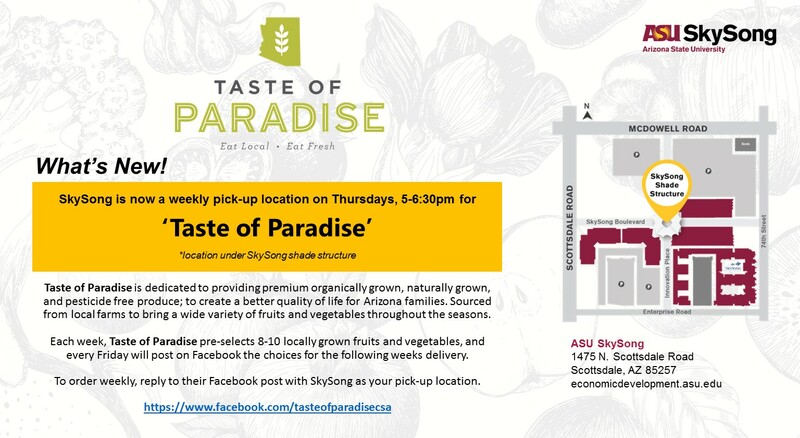 Taste of Paradise is dedicated to providing premium organically grown, naturally grown and pesticide-free produce to create a better quality of life for Arizona families. We source from local farms to bring you a wide variety of fruits and vegetables throughout the seasons. We are committed to this vision to help build more vibrant communities, a stronger local economy, and healthier lifestyles for generations to come. Each week we preselect 8-10 locally grown fruits and vegetables. Every Friday we will post on our timeline what will be in the bags for the following weeks delivery. To order, reply to the post with your desired pick up location and any substitutions that you would like to make. If there is something in the bag that you don't want, you can sub for extra of something else that is already going to be in the bag.